Gujarat High Court orders investigation after police allegedly opened fire and beat caste protesters in Indian city. The Gujarat High Court has asked the Ahmedabad police to investigate alleged police brutality during this week's massive protests by the Patel community over reservation policies. At least seven people were killed in unrest across the state, and the notice issued on Thursday gave the police two weeks to complete the probe. 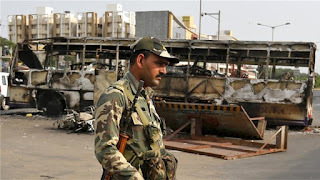 Earlier on Thursday, thousands of Indian army troops were deployed to riot-hit areas of Gujarat state, in what is being described by police as the worst to hit Prime Minister Narendra Modi's home state in more than a decade. The Indian army could be seen patrolling areas hardest hit by the caste-related violence on Thursday. According to NDTV , a curfew was still imposed on parts of Ahmedabad and Surat, with the police likely to review it later on Thursday. The violence appears to have been triggered by the brief detention of the 22-year-old leader of a mass movement by the Patidar or Patel caste demanding preferential treatment for jobs and university places. 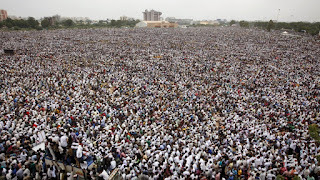 The director-general of police, PP Pande, told the AFP news agency on Wednesday that three people had been killed in the main city of Ahmedabad, where an estimated half-a-million people gathered for a rally on Tuesday. The violence later spread to other parts of the state and another two people were killed when police opened fire on rioters early Wednesday in Banaskantha district. A sixth protester died in Mehsana district later Wednesday, also in a police firing, the district superintendent J R Mothalia said. The police also said that the seventh victim was a police constable, who was beaten by a mob and later succumbed to his injuries in hospital. 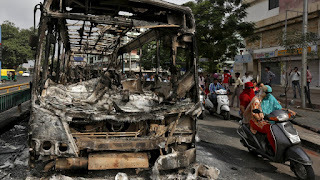 "I appeal to all brothers and sisters of Gujarat that they should not resort to violence," Modi said in a statement. "Violence has never done good for anyone. All issues can be resolved peacefully through talks," said Modi, who served as the state's chief minister for more than a decade, in a television address delivered in his native Gujarati. Media reports said it was the first time the army had to be deployed in Gujarat since religious violence in 2002 left more than 1,000 people dead, most of them Muslims. On Wednesday, the state government imposed a curfew in Ahmedabad. Political leaders appeared to have been taken by surprise by the scale of the protest movement, which began earlier this year but has rapidly gathered pace in recent weeks. India sets aside a proportion of government jobs and university places for Dalits, known as "untouchables", and for so-called "other backward castes" under measures intended to bring victims of the worst discrimination into the mainstream. 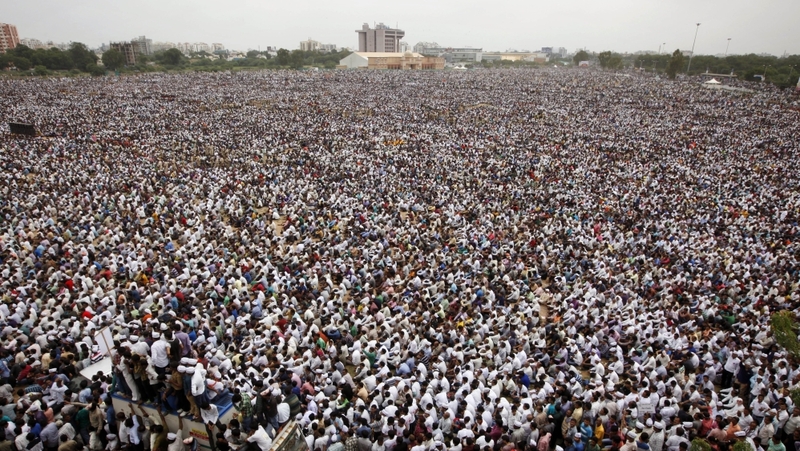 It remains unclear how Hardik Patel, the 22-year-old self-styled leader of the movement, managed to mobilise such huge numbers. "This is a fight for our rights ... we will continue with our campaign on the roads and the streets," he said in a television interview on Wednesday. Gujarat's chief minister, Anandiben Patel, urged members of her own community to maintain the peace.